The Teacher Resource Link (TRL) is an application that delivers vetted and aligned digital resources to Georgia's teachers. TRL is accessible via the GaDOE "tunnel" in conjunction with SLDS using the single sign-on process. The content is aligned to the Georgia Standards of Excellence (GSE) and National Education Technology Standards (NETS) and pushed to teachers based on course schedule. Using TRL, teachers are able to assign digital resources to students based upon the student's performance on an assessment or by searching for aligned resources by grade, subject, and standard. Resources found in TRL include Georgia Virtual School course content, NSDL, Thinkfinity, GaDOE subject frameworks, and additional teacher-aligned, vetted digital links. Digital content is available for most subjects in grades K-12. Resources are categorized into student and teacher resources during the search phase. TRL allows a teacher to search for resources aligned to a standard for student consumption or for teacher-directed usage. In addition, TRL provides a folders feature allowing teachers to save, assign, and store resources from year to year, school to school. How Can Teachers Access T​​RL? TRL is available to all teachers in the state of Georgia using the SLDS application. 1. 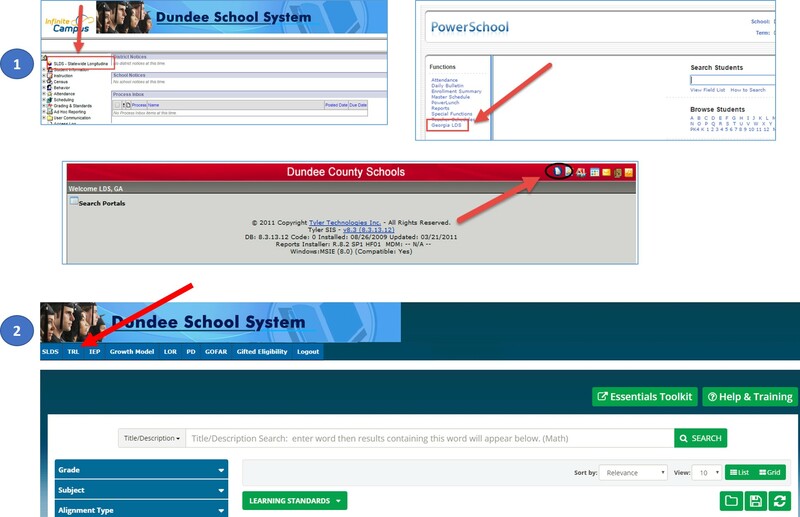 Within your current student information system, click on the SLDS link. 2. Once in SLDS, click on the TRL menu button.